We offer a full range of cable hire services for events shows and more. Energy Rentals is a power company on a mission. Our mission is to deliver high quality service and products offering cable hire to our varied customer base across the UK. From our office and warehouse complex on the London and Essex border, we are the number one choice for customers looking for cable hire whatever the occasion. Whether your requirements are events and special productions, or for dry hire to other rental companies or even to specialist projects, sites or industrial applications, we can help. We cover London and the Home Counties, so if you are in London, Essex, Kent, East Sussex, Surrey, Oxfordshire, or Hertfordshire in fact anywhere in the UK, call Energy Rentals the dynamic and experienced cable specialist hire company. We supply to a whole variety of customers for almost any occasion, so whether you are an event organiser, a local council, health and safety company, large scale outdoor event organiser, concert promoter, catering company, corporate bank, IT systems company, industrial factory, research and development plant, scientific company, energy supplier or a private function organiser Energy Rentals can help. We have miles of cable and miles of experience in delivering for our customers. So contact Energy Rentals today with your event or application hire requirements and we can supply you with a free no obligation quotation. We hold massive stocks of professional cable in rubberised HO7 RNF in a wide range of formats. For smaller applications, we have single phase 16 amp and 32 amp, moving up to 63 amp and 125 amp for larger single phase requirements with kilometres in stock of every range. When running large scale venues and projects we stock and use 3 phase power. Starting with 16 amp, this mainly being used for motor control and catering applications, moving up in the 3 phase range. 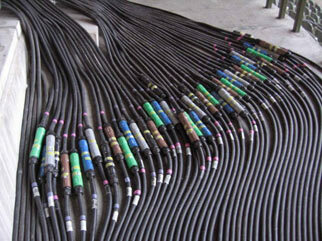 We also supply 32 amp, 63 amp and 125 amp cable for hire. At the top of our range are our power lock and cables in 400 amp, 800 amp and 1000 amp configurations, for massive show and industrial supplies. Energy Rentals has hundreds of thousands of pounds of cable hire stock, with kilometres of 3 phase and single phase cables. Contact us today to find out how we can power your event or application the Energy Rentals way. At Energy Rentals our customers are so varied and different from each other, that no two jobs are the same. It is because of this that we take a very flexible approach to our customer’s cable hire requirements. We have highly experienced project managers that can discuss your needs and requirements to deliver the correct solution for your event or application. We can supply dry hire, if you know what you want and your needs are simple, or we can offer a complete power solution with planning and consultancy, project management and technicians to deliver your power the way you want it, when you want it. So for full electrical production, installed by safe and qualified technicians whatever the event or application, no matter how big or small, Energy Rentals has the solution.